After laying low for the past couple of episodes, Cicada returns with a vengeance. He hasn’t killed anyone in a while and makes up for lost time by killing as many as he can. With his handy work so brazen, Team Flash is alerted right away, and they have to work quickly to stop his killing spree. When the team confronts Cicada during one of his kills, he responds by breaking Nora’s back in half and making an escape. Barry doesn’t handle any of his friends getting injured well, and seeing Nora so hurt she’s unable to heal has him making dangerous decisions. With anger getting the best of him, Cecile takes the lead in this investigation. With just a little bit of research and a touch of Meta powers, she discovers Cicada got his list from CCPD– all from Officer Jones, who is feeling the anti-Meta-Human sentiment after he was under Spencer Young’s control. The leaked list contains all the Meta-Humans currently free from jail. Even if they’re trying to get on the right path, Cicada is not making any exceptions on who he should kill. The team comes up with a plan to locate and round up all of those on the list. The idea is to get the targeted Meta-Humans into a protection program under the FBI. It’s a tall order and seems like a lot of effort to place them into protection instead of killing or disabling Cicada. The whole process of gathering them is messy, as the Meta-Humans are distrustful of Barry, even when they get Norvock to vouch for them. A few stories from Cicada’s work doesn’t convince most of them until they see him in person. Gathering a bunch of targeted Meta-Humans in one location is the worst idea when Cicada is exceptionally focused on killing them. He gets tipped off on their location, and it’s an explosive battle of trying to evacuate the Metas safely without losing a life. Barry is all too pleased to lay the smackdown on Cicada, coming close to killing him. It’s Nora, now healed, who runs to his side and begs him to stop. 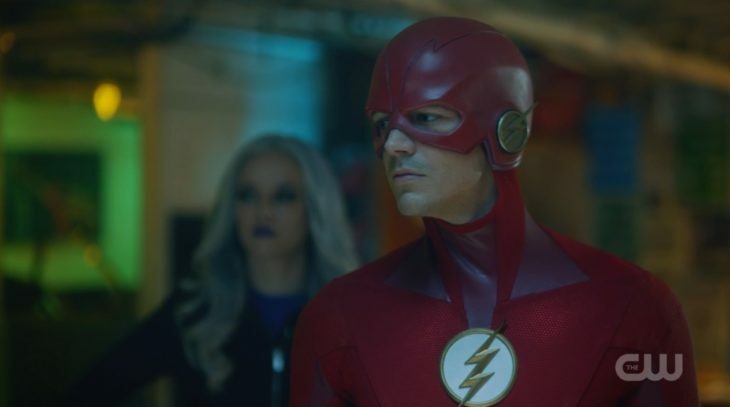 I know Barry is committed to his no-kill creed, but if Nora was going to jump in, she could have helped subdue Cicada and put an end to this. Nora’s arrival snapped Barry out of his rage; seeing her healed made him realize something: having their child healthy is all that matters. He asks the team to focus on healing Cicada’s daughter, maybe then he won’t see Meta-Humans in such a bad light. If that were the only factor driving him to kill. In his mind, he’s trying to think of a way to stop Team Flash. His answer may lie with Nora she is Barry’s weakness after all. While the main plot felt weak, it allowed for small progressions in other ways. Killer Frost and Ralph went into detail on how she truly feels about discovering the cure to being a Meta-Human. Allowing herself to be vulnerable with her fears strengthens the bond between her and Caitlin. The assurance of Caitlin’s love for her has Killer Frost relent and helps her with the next step of research. Sherlock has kept to the background, researching Nora and her journal. He feels she hasn’t been truthful to them, and deciphering her secret language may be a clue into her true intentions. When Iris catches wind of it, she lets Sherlock know what she thinks of his investigation. She doesn’t appreciate him looking into her daughter as a criminal, and warns him against continuing. Having all of Nora’s records being deleted from Gideon is a huge red flag, so Sherlock will not be stopping his investigation. I’m sure Iris’ threat will only ensure Sherlock will be a little more secretive about his research.